MUMBAI: Singer Enrique Iglesias, who injured himself on stage, continued to perform for 30 minutes despite the pain. The 40-year-old singer sliced open two of his fingers as he attempted to grab a drone, which he sometimes uses to show the audience a point of view angle, during a performance at the Bull Fight Ring in Tijuana on Saturday. He left his white t-shirt stained with blood, but he carried on for half an hour despite being advised to end the show. Iglesias's representative Joe Bonilla wrote on Instagram, "Last night Enrique had a show at a bullfight ring in Tijuana, Mexico for 12k+ people as part of his #SexandLove world tour. 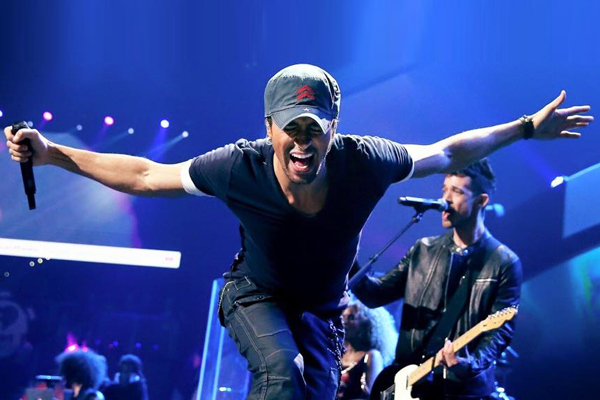 During the show a drone is used to get crowd shots and some nights Enrique grabs the drone to give the audience a Point of View shot. Ayer @enriqueiglesias sufrió un accidente durante su show en Tijuana. Decidió continuar el concierto para después ser atendido en Los Angeles. Su mano va recuperándose. "Something went wrong and he had an accident. He was semi-treated by crew on the side of the stage to try and stop the bleeding. He was advised to stop the show. He decided to go on and continued playing for 30 minutes while the bleeding continued throughout the show. (sic)"
The ‘Hero’ hitmaker's representative went on to thank fans for their ‘love and concern’ and said that the singer was treated by an ambulance at the nearby airport after his show, and is now seeing a specialist here. Bonilla added, "He was rushed to the airport where an ambulance met him. He was then put on a plane to LA where he was then put on a plane to see a specialist. We will continue to update as we have more info. Thank you all for your love and concern."